Being different could lead to a death sentence. In Divine Captive, Grace is mistakenly kidnapped for having psychic abilities. When her abductor discovers his error, she’s forced to use her wits to ensure her survival. Faced with enemies with incredible powers, she soon realises she may not be as ordinary as she’d always believed. Then in Spirit Unleashed, punished her entire life for not being psychic, her father’s death reveals everything Rose believed is wrong. Now she must find a way to control her new-found abilities before those who have misjudged her force her to fulfil their diabolical plans. In the exciting conclusion to the Arcane Awakenings Series, Grace and Rose have the odds stacked against them. Out-matched and out-numbered, they will have to fight for their lives. But will their burgeoning abilities lead them to victory or death? 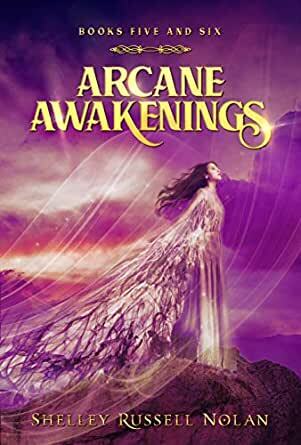 Arcane Awakenings – a fast-paced paranormal fantasy novella series. Divine Captive – Content with her life, a crush on a handsome, unattainable actor, and her job as a veterinary assistant, Grace feels no resentment toward her gifted cousin and her equally talented friends. Then someone mistakes her as having abilities too and locks her up with the man of her dreams. Grace never thought she’d meet Liam Devine let alone share a bed with him, but that’s what her abductor wants. Intending to keep Grace and Liam under his control and using their powers to do his bidding, she knows it’s only a matter of time before he realises he’s captured the wrong cousin. But for Grace, there are far worse things than death. I loved the way Grace thought of herself as ordinary but was then thrust into a world where she had to become more than who she thought she was to survive. In a situation that was terrifying she keeps her cool, especially when she discovers there’s also more to the people who surround her than she realised. I liked the twists in the story and how Grace stepped forward to claim her true identity when others depended on her. Spirit Unleashed – Rose has been told she’s nothing, mundane, a nobody all her life and she believes it, especially surrounded by so many gifted people like her father. Now she’s little more than his slave, expected to obey his every command. It isn’t until someone sees her, really sees her that Rose begins to question her father’s choices, and when he dies, little nobody Rose discovers she’s someone very special indeed. And now someone else has noticed, and they want Rose’s gift for their own, and they don’t care who they have to kill to get her, especially Rose’s newfound friends. Rose is the daughter of a psycho. He has abilities, is gathering a n army to take over the world. He kidnaps a former star Liam and Belinda's cousin Grace to be the figurehead for his campaign. Liam can control the minds of people and make them do what he wants. Grace has no abilities that she is aware of. Rose doesn't want to help her father......He thinks her useless as she has no abilities. Belinda and her friends rescue Grace, bringing the house down. Rose is captured by the really bad guys....Dr. Frankie and Dr. Wood. They are horrible people. But can Rise be saved?? Will things work out in this book like they have in the others? Or will we lose one of our heroes. Have to read to find out.